There are about 100 known species of Fuchsia. More than 8000 hybrids and cultivars have been developed from these which vary widely in form, size and growing habits. Fuchsias, sometimes known as "Lady's Eardrops", are tender, woody, evergreen shrubs which can attain a height of five feet or more. They can be safely grown outdoors in plant hardiness zone 10. However, some cultivars will withstand cooler climates, so long as they are not subjected to freezing temperatures. It is for this reason that the majority of fuchsias are grown as container plants. 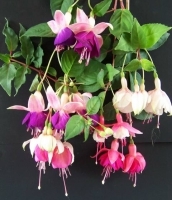 Outdoors, plant your fuschias in dappled shade where they receive plenty of air circulation which will reduce the chance of botrytis, especially in humid areas. Fuchsias have a very small window of optimum temperature and growing conditions. Most need a rather humid atmosphere. Ideally, daytime temperatures should be between 60 and 70�F with nighttime temperature of 10 degrees lower. Some variation of course is acceptable. If daytime temperatures rise above 80�F for any length of time, plants will be stressed, blooming will stop and plants may drop leaves. You can alleviate some of the damage by daily watering and misting the foliage as well as the surrounding area. There are two primary growing types; upright and trailing. For container gardening, the uprights make lovely specimens either in their natural form or trained as a standard (tree form). Choose terra cotta pots or other large vessels such as wooden half barrels and decorative plastic containers. Trailing fuchsias are ideal for window boxes or hanging baskets that can be either protected or moved indoors during cold weather. Fuchsias require a rich, well drained and somewhat acid soil. You can purchase good potting soil at your local garden center, or mix your own, consisting of equal parts good garden loam, compost and peat moss. A small amount of aged manure is beneficial as well. Plants should be well watered and fertilized regularly during the growing season, but kept just moderately moist and without fertilizer during the cooler months when they are resting. Fuchsias will delight you with their delicately charming pendulous blossoms which often display double frilly 'skirts'. Colors range from pure white to pink, rose, red, purple and bicolors in every combination including orange. Remove spent bloom to prevent seedpods from forming and to conserve plant energy. Flowers are produced on new growth only. Therefore, it is a good practice to cut back old wood to about one third of their height in spring, before new growth begins. This will cause the plant to put forth many new shoots which will terminate in buds and flowers. Propagation of fuchsias is by stem cuttings taken either from new, half ripe spring growth or mature tip cuttings in the fall, after the blooming cycle. Cuttings should be three to six inches long with at least 3 and up to 5 pairs of leaves. Strip the lower leaves, leaving at least 2 pair, and insert the stems in rooting hormone and then into a moist seedling mix. Keep in bright light, out of direct sun, in a humid area until new roots develop. You can help with humidity by either periodic misting, or covering the container with clear plastic, leaving some openings for air circulation. Once rooted, plants can go into individual pots. Pinch out tips when they have developed about 2 to 3 inches of new growth to encourage branching. Once started, fuchias are fairly fast growers and you will have nice young plants in the spring to plant out and enjoy on your patio or in a shady corner of your backyard garden.